Last week I received a mysterious "confidential" envelope from an Agent D. Perez supposedly from the Feds. I sorta freaked but then discovered it was a bit of ingenious press kitting from the makers of the found footage horror indie Evil Things (IMDB here). I was set to watch the film for reviewing purposes last Thursday only to discover my DVD player doesn't play nice with the DVD-R. 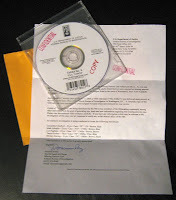 Despite the disc being authored correctly as a single layer DVD, at just six minutes in the picture and sound suddenly halt and the player becomes totally unresponsive even after repeated attempts. I'm one of the few on planet Earth who lack computer speakers, so popping this into to my DVD-ROM is a no-go. So I'm stuck until I haul out my other player and hook it back up. I feel an obligation to Dominic Perez and the powers that be behind Evil Things (official site) to say I really appreciate the chance to review your film and the rather frightening surprise in my mailbox. Though it might take some time before I can do what's necessary to watch the other eighty eight minutes. In lieu of a BoGD review right now, here's several other reviews from fellow bloggers since the film seems to be popping up all over the horror blogosphere as of late. I will get to my review sometime after the holidays. Although judging by skimming over these, I'm missing out! If I happened to miss your review, please feel to post a direct link in the comments section! Check out the film's trailer over at YouTube! Hey dude, shot Dom an email and asked him to shoot you out another copy, hope you get a chance to see it soon! Yeah totally shoot an e-mail to Mr. Perez. Evil Things is a great way to close out 2009.